This little guy was brought to me by a little girl at a beach party in Okinawa, Japan. Don't worry. I took 500th of a second to snap the photo and told her hurry and put him back in the water. He's a fish even if people call him a horse. He went right back into the ocean, just a few feet away. I hope everything turned out alright for the guy. 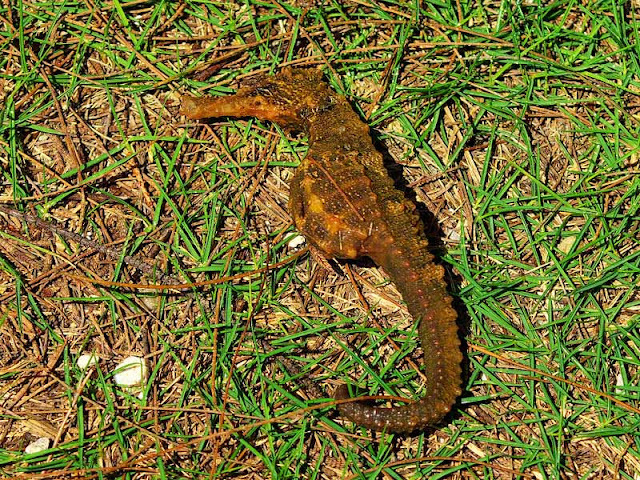 Seahorses, and there are over 30 varieties of them, come from the Genus Hippocampus. They are members of the Family Sygnathidae, which also, includes Sea Dragons and Pipefish. Probably, their worst natural enemy is people. Remember all the comic books advertising ? They start making whoopie early in the morning and might take 8 hours to finish. The female puts eggs in a pouch the male has and he gets pregnant. He could be pregnant a couple of weeks and have as many as 2,000 babies. He might deliver all those babies in the morning, get another batch of eggs thrown in the basket and be like, el prego, again by nightfall. I don't make this stuff up ! I LEARNED ALL ABOUT SEAHORSES TODAY AT NATIONAL GEOGRAPHIC ! I've always loved seahorses... maybe even more so after having my 2 boys and carrying them myself. May be nice to have the male carry them haha. That poor guy could have 2,000 babies in him. Ouch ! Oh! Why is it that seahorse looks dead? The poor little guy. I hope he made it. 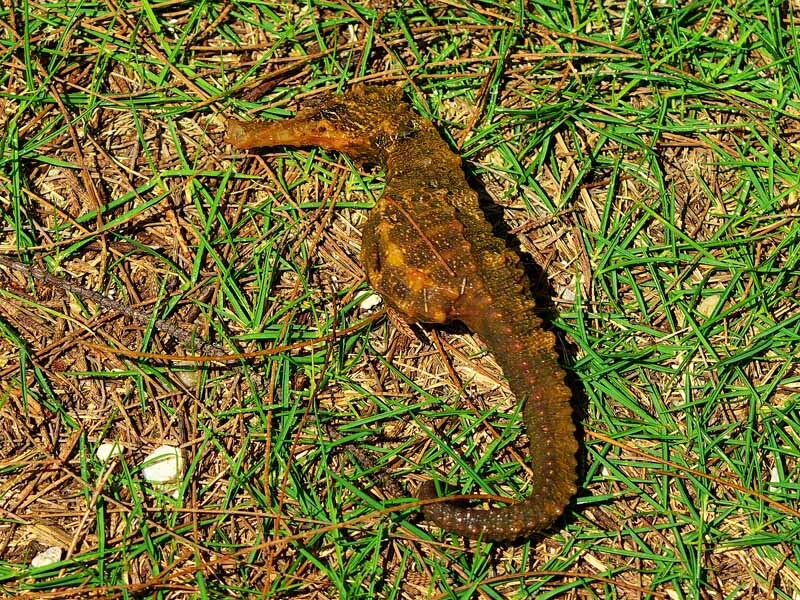 Reproduction is really a partnership with the seahorses. Eight hours of mating is probably more work than fun. No worries, he was very much alive. Just, I toned down the photo to eliminate glare. The patch of grass he's in wasn't spitting distance from the ocean and he went right back in, gently. He does have a rather large looking belly. Mighta been a dude!